Amaretti Cookies: Preheat your oven to 375 degrees F (190 degrees C) and line two baking sheets with parchment paper. To make all the cookies the same size, I like to make a template. Take a piece of parchment paper and draw 20 - 1 1/2 inch (4 cm) circles, spacing the circles about 2 inches (5 cm) apart. Place the template under your parchment paper so you can use it as a guide. Place the sugar in the bowl of your food processor and process until finely ground (about 30 seconds). Add the almond paste and pulse until the mixture is very fine (the mixture will be grainy). Add the egg whites in two additions, processing well after each addition. Continue processing the batter until it's nice and smooth. Fill a pastry bag, fitted with 1/2 inch (1.5 cm) plain tip, with the batter. Pipe 1 1/2 inch (4 cm) mounds of batter onto the parchment paper, using the template as a guide. Remove the template and, with a damp fingertip, gently smooth any tips of batter at the top of each cookie. 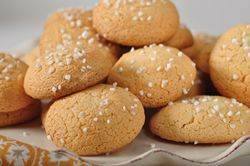 If desired, lightly sprinkle the top of each cookie with a little sugar. Bake for about 15 minutes, or until the cookies have risen, are a deep golden color and have tiny cracks. Remove from the oven and place the baking pan on a wire rack to cool. When cool, gently peel the cookies from the parchment paper. If the cookies are sticking to the parchment, turn the paper over, take a damp paper towel and gently wipe the bottom of the parchment paper to loosen the cookies.